Egyptians and Persians used to dye eggs in spring colours and give them to friends as a symbol of renewed life. In Germany, eggs are dyed green on Maundy Thursday, while in Greece the traditional colour is red to represent Christ's blood. 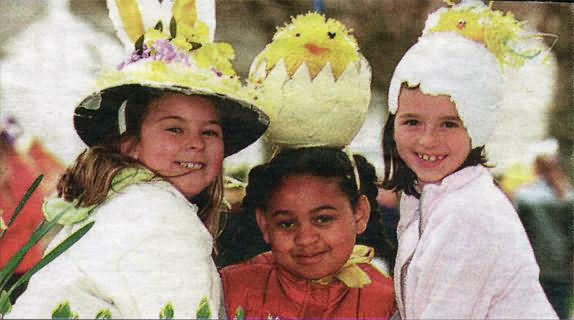 Easter bonnets are a throw-back to the days when people denied themselves the pleasure of wearing finery for the duration of Lent. Churchgoers would wear some bright new piece of clothing - a sign of new life. Egg rolling is supposed to symbolise the stone being rolled away from the tomb where Jesus was laid. The tallest Easter egg was recorded in South Africa in 1996. It was 7.65 metres (25 feet) tall and weighed 4,068 kilos. The largest Easter egg hunt took place in Australia in 1999 when 150,000 chocolate eggs were hidden by troops and found by 3,000 children. About 80 million Easter eggs were eaten in the UK last year, as well as almost 500 million cream eggs. The first example of buns being baked to mark the beginning of spring was seen in ancient cultures such as the Assyrians, Babylonians and Egyptians. Buns were marked with a curved shape representing the horns of an ox, the animal associated with the moon, and were offered to the goddess connected with fertility and renewal. It is thought that the Greek for ox, «boun», may have given us our word «bun».